The second person to walk on the moon said that setting up habitation on the surface of the red planet was a “wonderful objective” for humanity. Given the backdrop of the ailing world economy, space exploration could offer younger generations much-needed goals, the 79-year-old said. “I think we need to look quite a way down into the future to inspire our young people with that greatness. “America helped to take the world to the moon 40 years ago and America certainly can help lead the world in the direction of Mars.” After he entered the history books Dr Aldrin said he struggled through a dark time during which he did not know what he should be doing with his life. He battled depression and alcoholism, but has now been sober for 30 years and married to his wife Lois for 23 years. The former astronaut said he was aware he had a unique perspective on the universe and had tried to share this with others. 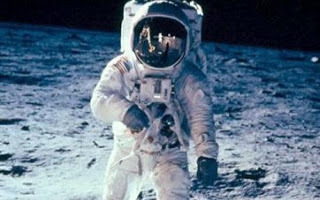 “Not that many people have been on the moon and that’s why I have written two children’s books and I am involved in modern communication with a website and Twitter,” he said. “I try and communicate with people – recently I got together with a few experts and did a rap session that you can download.” But while trying to spread the word about the possibilities of space, Dr Aldrin said he was sceptical of climate change theories. “I think the climate has been changing for billions of years,” he said. “If it’s warming now, it may cool off later. I’m not in favour of just taking short-term isolated situations and depleting our resources to keep our climate just the way it is today. “I’m not necessarily of the school that we are causing it all, I think the world is causing it.” Dr Aldrin was in London to promote the publication of his memoirs Magnificent Desolation – a title taken from his comment when setting foot on the moon: “Beautiful, beautiful. Magnificent desolation.” The world watched the astronaut and his mission commander Neil Armstrong become the first humans to walk on the moon on July 20, 1960, as part of the Apollo 11 mission.